Steven Bochco once said “I think the best work flows out of a collaborative environment”. As work is a large part of your life and you spend more time at the office than at home, colleagues, meeting rooms and the coffee machine have to be top notch. All businesses need to be flexible and move with the times. Even more importantly to survive in business you need professional partnerships that allow for mutual growth. Due to a flood at their previous offices, we arranged (in one morning) some meeting rooms and office space, for the BlueMagnet team to continue their meetings and lecturing 2 groups of up to 15 people. We arranged for our front desk to take calls while the team dried off and got a treat at the business café. Clients were looked after and our passionate team tailored our dynamic services to allow BlueMagnet to do what they do best. “The speed at which The Business Centre ensured we were operational and the friendly professionalism of the staff and the warm muffins, made us question why we had ever left. And so the seed was planted to return to where our business began” said Gillian Meier, CEO of BlueMagnet. The actual move took place on a Monday morning and the team were all settled with their access cards (including coffee credits for numerous cappuccinos), parking bays, and office furniture by 10am. The clients were mailed the new address and the phone calls patched through. All seamless. Flexibility and design go hand in hand in making for a happy working environment, which leads to better productivity. BlueMagnet have made use of 2 of our 3 flexible offerings during their stay with us. They started out with our furnished solution and when they came back we made them feel right at home through our unfurnished offering. We are glad that when they wanted office space for rent with flexible meeting rooms and training rooms, we came top of mind. 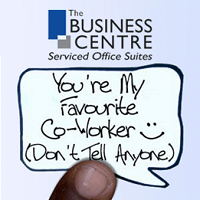 It is great to have them back with us at The Business Centre and we wish Gillian and her team every success. In the words of Henry Ford; coming together is a beginning. Keeping together is a process and working together is success. Watch our centre managers from our Broadacres Business Centre and come share a coffee with us. Who knows you may end up like BlueMagnet were our passion and solution become your reality.